Welcome to Bethville! : Four No-Fail Ways to Lose Weight...And Keep It Off! Four No-Fail Ways to Lose Weight...And Keep It Off! So, you want to lose some weight? All you eat is raw spinach with carrot slivers covered with a dressing made of laxatives. You jog 10-15 miles every afternoon wearing 25-pound leg weights. You even take your Anabolic Fat Burner Meth Caplets every morning. But nothing is working! You are still over the triple-digit mark, and all of your thinner friends make fun of you for shopping in the women's department. Never fear! I have some great tips to help you lose weight. Permanently! 1. Never! Eat! Again! It's all so simple, I'm amazed I only thought of it just now as I was penning this wonderful and very informative blog post. Think about it! What do we really need? Lots of nutritious vitamins and water, right? So, if you simply take a vitamin supplement for breakfast, lunch, and dinner with a tall, frosty glass of H2O, the weight will simply melt away. *Fashion tip: Once you drop 75-80 pounds, you'll definitely be able to fit back into those 6-9 month onesies from babyhood. Pair one of those with some thigh high boots and a cardigan for a daring fall look! 2. Chop off a limb! Think about it. You don't really need two arms. And one arm, on average, makes up 5-6% of the total body weight. So, if you weigh 105 pounds and remove one arm, factoring in the weight of the arm and blood loss, you will end up weighing between 98 and 99 pounds! No drastic diet necessary! *Fashion tip: Two words. One glove! 3. Travel everywhere with several thousand helium balloons. Helium isn't only an unreactive, colorless, and odorless monoatomic gas, and the second most abundant element in the universe after hydrogen. It's also for making fat things weigh less! One balloon can lift around 14 grams of mass. So, if you weigh 100 pounds, grab around 3,000 balloons every morning, and you will weigh only about 92.7 pounds! *Fashion tip: Watch out for low-flying aircraft! 4. Die! Yes, it's drastic. But think how thin you'll be as time and decomposition melts away all that disgusting fat. And just think, you'll never have to eat another flavorless steamed vegetable. *Fashion tip: Write out funeral seating place cards beforehand and put those individuals who displeased you during your lifetime in the very back row! After following one or more of these weightloss plans, you will absolutely see results! Without dieting! ***Disclaimer: This post was written in jest. Don't really do these things. They are dangerous and quite stupid. 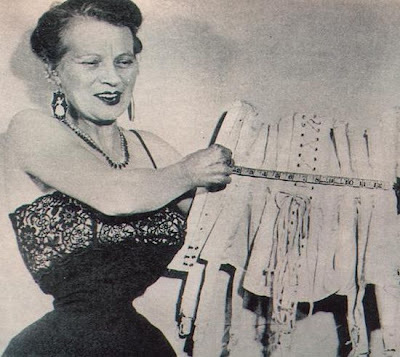 ****The photo featured at the top is the now-deceased tiniest waist world record holder, Ethel Granger, at 13 inches. Her waist must be totally smaller now that she's dead. *****Have more dieting ideas? Post them in comments. OMG, I thought that picture was Photoshopped! Scary! @Jen: Nope, it's totally real. I recommend not ever Google image searching Ethel Granger. Or Cathie Jung, who is the current record holder at 15 inches. Direct that last comment to Jen #2. Are you two different Jens? OMG. It's a Jen party. @Jen: The picture has not been Photoshopped. That is the actual effect of wearing a corset all the time and lacing it extremely tightly. Screwed up ribs and smooshed internal organs, woot! @Jen #1: You would think they would realize that it just makes their butts look huge in comparison. I love when I can tell you did actual scientific research for a post. @WB: I also did algebra to determine how much you would weigh if you only carried 3,000 balloons. Something fishy with your algebra. 3000balloons x 14g = 42000g = 42kg = 92.6lbs of lift... so if you weighed 100 lbs and wanted to weigh 90.7, you'd only need to carry 300 helium-filled balloons, for a total lift of 4.2kg. Another way to weigh less is to hang out underwater. Your weight would be your original weight minus the weight of the amount of water you displace. @t.c. : Why do you always have to be so contrary? I didn't say I was good at algebra. Wow, move over bearded lady.